With the best of conditions under sunny skies, the Mavericks Invitational, the so-called Super Bowl of surfing, was won by South African Grant "Twiggy" Baker. Baker also won the title in 2006 and reclaimed the title on Friday afternoon, with Hawaiian Shane Dorian coming in second in his first Mavericks contest and Ryan Augenstein of Santa Cruz coming in third. Fellow Californians Tyler Fox of Aptos, Greg Long of San Clemente and Anthony Tashnick of Santa Cruz rounded out the six surfers who made the finals. “I got lucky today. I didn't get bucked off," Baker said. Now Baker takes home the $12,000 -- and a lot of respect from fellow surfers. 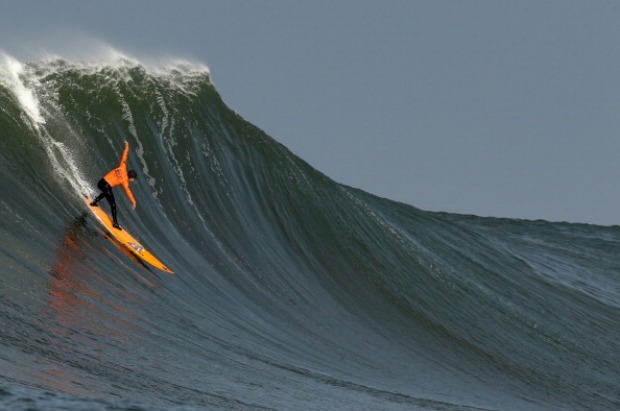 "Mavericks is a one-of-a-kind wave that you've got to prepare for, for life and for years,” competitor Rich Peters said. “So it's not something to take lightly. I really respect these guys. They're athletes just like any other athlete." The competition kicked off Friday morning off the coast of Pillar Point north of Half Moon Bay, Calif.
As predicted, the big waves reach astounding heights of between 40 and 50 feet. The surfing conditions were so ideal, that Hawaii-based professional surfer Mark Healey told NBC Bay Area that there are "no excuses" for surfers not to do well during the contest. First place is $12,000, second place is $6,000 and third place is $5,000, according to Mavericks Invitational spokeswoman Jessica Banks. 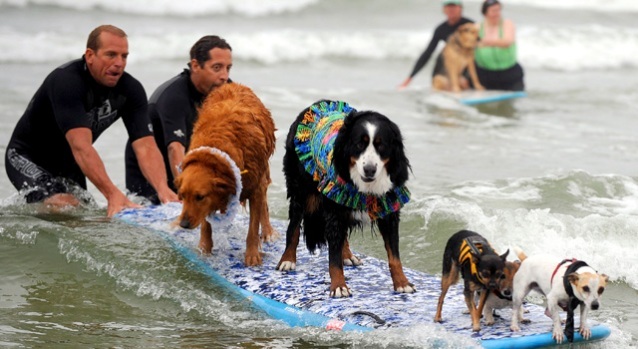 Surfers this year hailed from Santa Cruz, Pacifica, San Francisco, San Clemente South Africa, Hawaii, Brazil and Australia. Crowds began gathering on Thursday because they were anxious to snap and sketch pictures of practicing surfers from a vantage point they won’t be able to get on Friday because of restrictions that keep the public away from the beach. 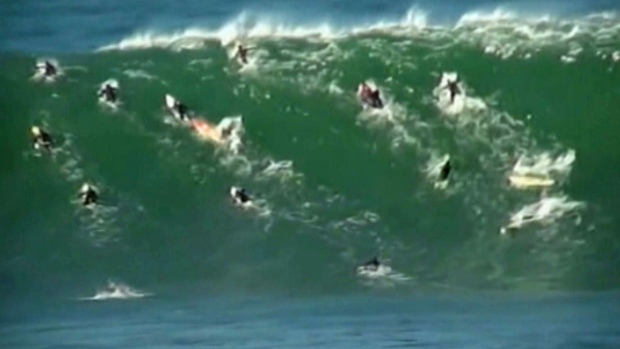 In 2010, several contest onlookers were injured by large sneaker waves. The Mavericks Invitational, the so-called Super Bowl of surfing, is ready to begin Friday morning off the coast of Pillar Point. Chase Cain reports. That’s why, this year, spectators were able to watch at a beer garden being constructed outside the Oceana Hotel, or one of the many bars and restaurants anxious for this year's Mavericks. But Mavericks pioneer Jeff Clark said the upwards of 40-foot waves are exactly what make his Mavericks competition so challenging and the trophy such a prize. 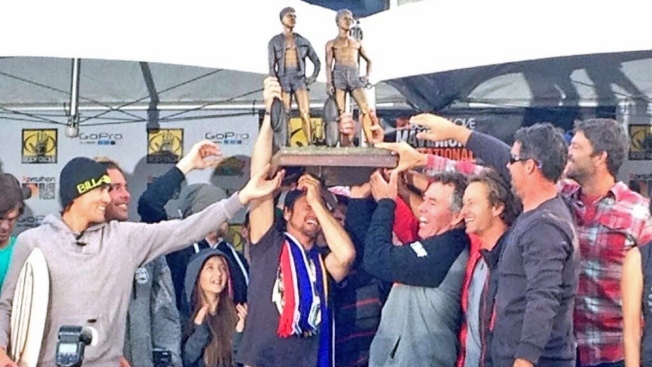 "I would say this is pretty close to the Lombardi trophy for surfing,” Clark said. “It takes everything you know about the ocean to compete and survive and be successful at Mavericks when it's this big."